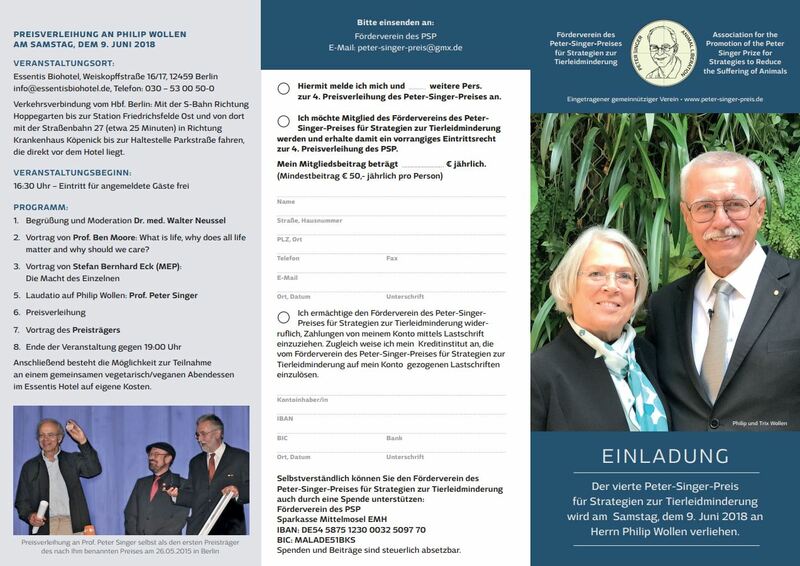 Förderverein des Peter-Singer-Preises für Strategien zur Tierleidminderung e.V. Der fünfte Peter-Singer-Preis für Strategien zur Tierleidminderung wird am Samstag, dem 29. Juni 2019, in Berlin an Herrn Mahi Klosterhalfen verliehen. Interview with Philip Wollen, 9th of June 2018 in Berlin, Germany. Filmed and edited by Martin Smedjeback (Quelle: Martin Smedjeback, 2018). Der australische Philosoph Peter Singer stieß in den 1970er-Jahren eine gesellschaftliche Diskussion über den moralischen Status von Tieren an, die bis heute anhält. Doch Singers teilweise umstrittene Philosophie richtet den Fokus nicht nur auf Tiere, sondern auch auf Menschen und darauf, wie beider Leid in der Welt möglichst effektiv gemindert werden kann. hpd-Redakteurin Daniela Wakonigg sprach mit Peter Singer am Rande der Verleihung des Peter-Singer-Preises 2018 in Berlin (Quelle: Daniela Wakonigg, Humanistischer Pressedienst, www.hpd.de, 04.07.2018). Zusammenfassung der Preisverleihung des 4. PSP an Philip Wollen vom 09. Juni 2018 (Quelle: Humanistischer Pressedienst, www.hpd.de, 2018). The undersigned call for the elaboration of an animal-oriented future strategy for animal breeding and animal farming and demand the immediate termination of the cruel breeding and cruel factory farming of Turkeys. In its opinion „Wege zu einer gesellschaftlich akzeptierten Nutztierhaltung“ („Towards a Socially Acceptable Livestock Farming“) from March 2015, the Scientific Advisory Board for Agricultural Policy (Wissenschaftliche Beirat für Agrarpolitik) at the German Federal Ministry of Food and Agriculture concludes, that our current livestock farming is not sustainable with regard to relevant social objectives such as protection of the environment, animal welfare and consumer protection.The daily practice of our agricultural production is largely linked to cruel breeding and cruel factory farming, which is the reason why they call for profound changes in livestock farming. CRUEL BREEDING can be defined as the practice in which breeding measures lead to unreasonable pain, suffering, health damage and behavioral disorders among the animals concerned. In facilitating the suffering of animals out of economic and profit-oriented interests, an ethically unacceptable situation is accepted. According to Article 11b of the German Animal Protection Act, cruel breeding is forbidden. In the daily practice, however, we see that the law is not implemented sufficiently and that the jurisprudence is interpreted in a far too lenient way towards the animal farmers. CRUEL FACTORY FARMING can be defined as animal farming in which the animals concerned experience permanent stress, caused by a high population density, life-long dwelling in their own droppings, growing up in closed halls without free access to the open air, as well as by mutilation and obstruction of type appropriate behaviour. This kind of cruel farming is tolerated on a frightfully large scale, because there are no clear definitions for when the breeding of animals becomes cruel breeding and cruel farming. Accordingly, we should demand without further delay that the legislator – as already long required by veterinary medicine – elaborates binding parameters, which can be used by breeders and enforcement authorities. There is a need for a clear distinction between the extent of reasonable limitations and the unacceptable injuries, pain and suffering caused by breeding and farming. In the field of the industrial production of turkeys, the abuse is particularly striking with regard to cruel breeding and cruel farming. In its elaboration into farm animal, the turkey is probably the animal which had to undergo the most genetic manipulations, yet as a species the turkey is unsuitable for industrial intensive farming from an ethical point of view. There is no EU animal welfare guideline for turkeys. Due to the serious genetic changes and the system-induced disregard of animal-friendly conditions in animal farming, the turkeys are therefore exposed to considerable pain and suffering. People of good will should not tolerate these conditions in turkey breeding and farming any longer. For the EU agricultural policy in general the following is applicable: „The money for the turnaround would be there. A sum of 6.8 billion EUR on agricultural subsidies is paid by the EU alone to German farmers, the height of the amount depends mainly on the surfaces cultivated. It would be better if there was a connection between the money and the conditions of the animals, and, in parallel, funding a monitoring covering all areas a comprehensive monitoring „(Der Spiegel 38/2016). The Austrian Animal Protection Act prohibits in § 5(2)1 „breeding […] in which it is foreseeable that it is associated with pain, suffering, harm or anxiety for the animal or its descendants“. In addition, § 5(2)(13) prohibits „the accommodation […] of a […] animal being kept in such a way that the animal is subject to pain, suffering, damage or serious anxiety“. Furtermore, § 16(1) „The freedom of movement of an animal must not be restricted in such a way that the animal is subject to pain, suffering or damage or is put into serious anxiety“ and § 16(2) „The animal must have a space that is suitable for its physiological and ethological needs“. These general provisions are gravely violated in turkey farming in particular. The varieties used for breeding in Austria are „Converter“ from Canada and „Big-6“ from England. These animals get so heavy and immobile that natural reproduction is not possible. The male animals get 5 times as heavy as their natural species. Research by the VGT has shown that the turkeys in the mast-halls have little moving space. 70% of the animals move less than 2 m in 10 minutes on average per day, 55 less than 1 m. They suffer from lameness, necrosis of the chest muscles and leg weakness. The farming is particularly cruel. In Austria, about 1.3 million turkeys are slaughtered per year. There are 144 farms, where at any given moment on average 4500 turkeys are kept in halls. The mortality rate due to the farming conditions is about 15%. The beaks of all the turkeys are burned off with lasers, so that they can’t pick each other in despair. They have to live in unstructured halls with initially 3 turkeys per m², later 3 turkeys per 2 m². To this end, the halls are never cleaned for the entire 5 months, their droppings accumulate up to 30 cm in height. This is the current situation, although the 1st Austrian Ordinance on Animal Farming provides that the excretions of animals are to be „removed as often as necessary“. 30-40% have corresponding wounds on the feet and chest due to burns. In 70% of the Austrian plants the lighting is kept on 20 lux 24 hours per day. The animals don’t show any sleeping phases. Instead, cannibalism and heavy fighting are prevalent. The catching, transport and slaughter of turkeys were also documented by the VGT in Austria.There is a lot of violence in it, accompanied by suffering, pain and great anxiety. 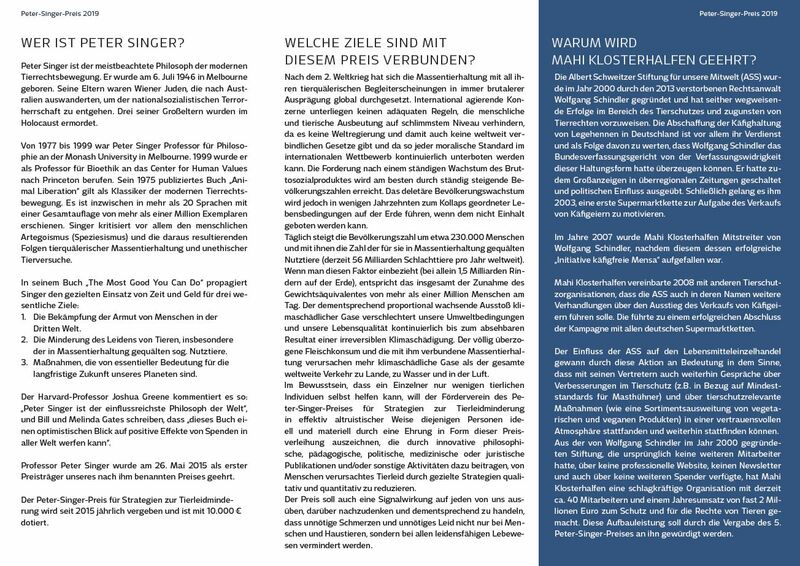 The VGT joins the initiative of the Förderverein des Peter Singer-Preises für Strategien zur Tierleidminderung (Association for the Promotion of the Peter Singer Prize for Strategies to Reduce the Suffering of Animals) against cruel breeding and cruel factory farming, especially with regard to Turkeys. The above basic text for campaigns against cruel breeding and cruel factory farming, including the supplement by the VGT, is to be understood as an organizational contribution to the reduction of animal suffering. It will be used by Provieh eV in Germany and the Verein gegen Tierfabriken (VGT) in Austria for their relevant campains. The text is also freely available for other organizations and motivated individuals who feel committed to act against the inhuman conditions in modern agriculture. It can be used without any changes including the list of undersigned included, or parts of the text without the list. I would like to thank all the signatories and all animal friends and animal rights activists who have contributed to the improvement of the text from the bottom of my heart. Berlin: Am 06.05.2017 fand im Essentis Biohotel in Berlin die Verleihung des Peter-Singer-Preises für das Jahr 2017 statt. Die Preisträgerin war die vegane Buchautorin Dr. Melanie Joy. Sie prägte mit ihrem Bestseller („Warum wir Hunde lieben, Schweine essen und Kühe anziehen“) den Begriff „Karnismus“ und vermittelt durch ihre Publikationen, ihre Vorträge rund um den Globus und über ihr Netzwerk „Beyond carnism“ die Zusammenhänge, warum wir bestimmte Tiere töten und essen und anderen streicheln. Durch ihre Tierrechtsarbeit trägt Melanie Joy maßgeblich dazu bei, in qualitativer und quantitativer Weise zur Leidminderung von sogenannten Nutztieren beizutragen. Vor vollem Saal – darunter auch Gäste aus Nah und Fern (Martin Balluch, VGT Österreich, Krishna Singh, PETA Deutschland uvm.) 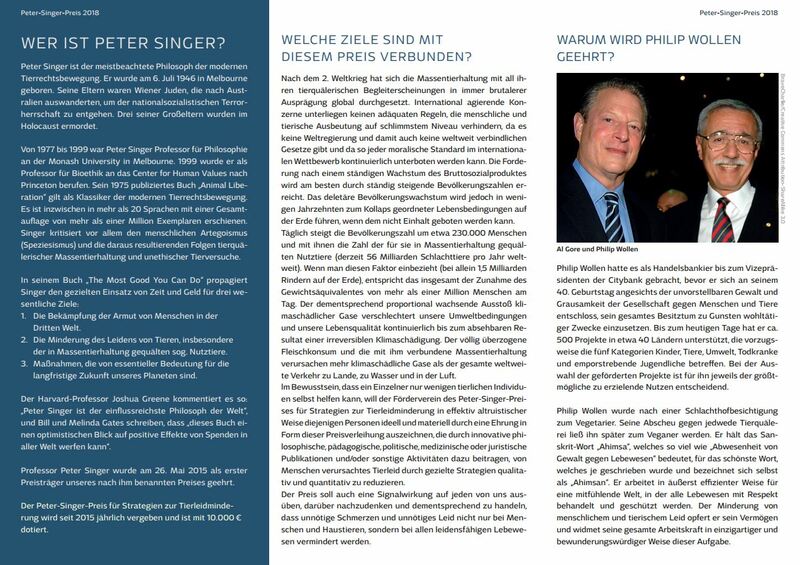 eröffnete Mahi Klosterhalfen (Albert Schweitzer Stiftung für unsere Mitwelt) als Moderator die Veranstaltung mit der Verlesung eines Grußwortes von Prof. Peter Singer, dem Namensgeber dieses Preises und des Vereins, der es sich zur Aufgabe gemacht hat, Menschen, die in außergewöhnlicher Art und Weise zu einer Verminderung von Tierleid beitragen, mit einer Medaille und einem Geldpreis von 10.000 Euro zu ehren. Nachdem Ria Rehberg mit einem sehr eindringlichen und ergreifenden Vortrag über strategische Tierrechtsarbeit aus Sicht von Animal Equality gesprochen hatte, hielt Dr. Walter Neussel, einer der Vorsitzenden und Initiator des „Fördervereines des Peter-Singer-Preises für Strategien zur Tierleidminderung e.V.“, eine Rede über den „Berliner Apell gegen Qualzucht und Qualhaltung“. Im Anschluss sprach der EU-Abgeordnete Stefan B. Eck, ebenfalls Gründungsmitglied und einer der Vorsitzenden des „PSP“, über seine praktische Tierschutz- und Tierrechtsarbeit im EU-Parlament. Als Beispiel ging er auf seinen Initiativ-Bericht zum Verbot der Batteriekäfighaltung von Kaninchen detailliert ein. Im Anschluss hielt die Autorin Dr. Tatjana Visak die Laudatio auf die Preisträgerin. 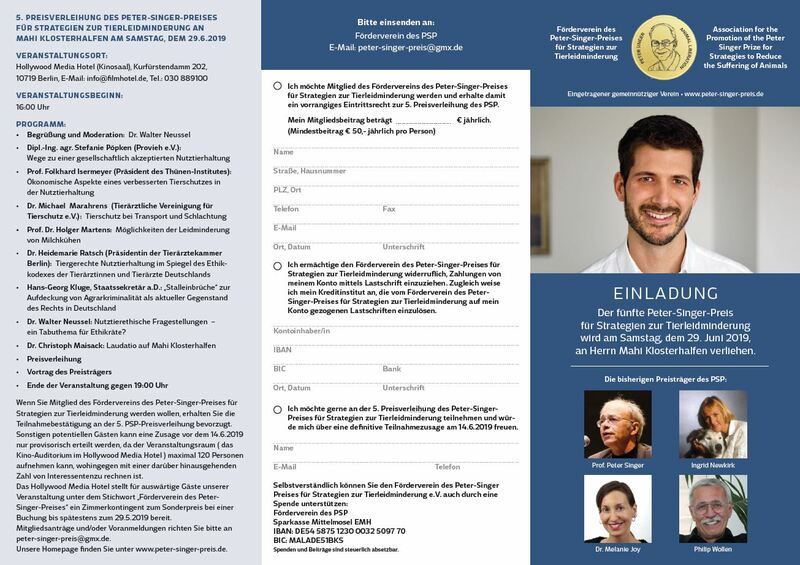 Der Vorstand des Fördervereins des Peter-Singer-Preises für Strategien zur Tierleidminderung e.V. überreichte Dr. Melanie Joy unter dem Applaus der anwesenden Gäste die silberne Peter-Singer-Medaille nebst Urkunde und einen symbolischen Scheck. Die Rede der Preisträgerin, die mit stehenden Ovationen quittiert wurde und die anwesenden Besucher*innen sichtlich begeisterte, beendete den offiziellen Teil der Feierlichkeiten. Nach der Veranstaltung und einem veganen Essen wurde mit ca. 50 Gästen bis tief in die Nacht über Strategien zur Tierleidminderung diskutiert.